Rocco C. Siciliano broke new ground as the first Italian-American to serve in the White House as an assistant to the president, Dwight D. Eisenhower. At 31, "Ike’s Youngest" attained a prominence not suggested in his humble beginnings in Salt Lake City, Utah. But his upbringing in the Mormon-dominated community, where he balanced the heritage of his striving immigrant parents with his own aspirations for success, prepared him for a wide variety of service. This service includes leading a special weapons platoon in the 10th Mountain Division in World War II, bringing Martin Luther King Jr. to meet with President Eisenhower, and becoming a recognized business leader in California. Siciliano used his expertise in labor, personnel management, and business to contribute substantively to the J. Paul Getty Center, the Los Angeles Philharmonic Association, the Committee for Economic Development, and the "Volcker" Commission on Public Service, among others. The variety of Siciliano’s experiences reinvigorates our understanding of the forgotten art of public service. 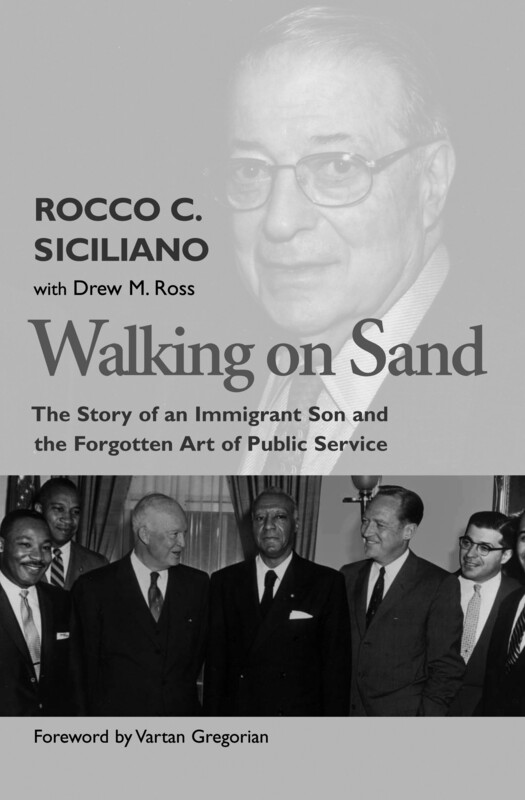 Walking on Sand emphasizes the role that public service can play for corporations, communities, states, and the nation. This story is a gift from the Greatest Generation to the many people who serve America today and will serve her tomorrow. Rocco Siciliano lives with his wife in Beverly Hills, California.